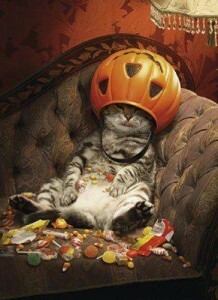 A little Halloween fun from me to you …. Reading scary Halloween stories was such f un. Our scary stories were never a bore. Those were the days when laughter was our ‘rich’. Life for her is good, but not without its strife. Not much time for fun in her every day. How she was a princess, a devil, and the belle of the ball. Teaching me that laughter, friends, and dress-up are all still divine. Because if you resign you are as good as done. It is time for greeting monsters and fairies at the door. That time is a thief and fantasies our best bet. Believe for a moment, let yourself go, be wild. That our childhood is something we should never surrender. (I think we can all agree that Simon & Schuster won’t be soliciting my poetry any time soon). But it was awesome fun! 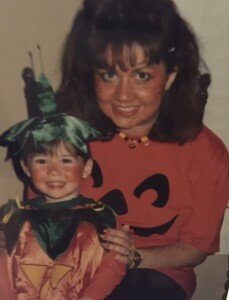 I miss the old days of Halloween. Dressing up our little girl, Halloween parades, ghostly cupcakes, Monster Mash playing on the radio and children squealing with delight at each other’s chosen costumes. Mostly I miss her. Watching how happy she would always be to be a witch, a lion or a pumpkin. Those were the days when we had time for each other. Lots of it, it seemed. I look back now and know that time had never moved faster. 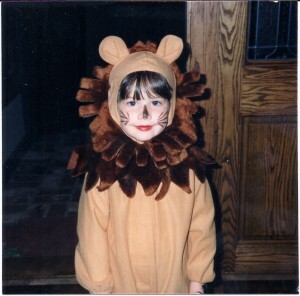 These days I experience Halloween vicariously through that same little girl (who happens to be 30 now). She and her fabulous husband still celebrate Halloween with wild abandon. I love that. In her honor I wrote this little poem and decided to subject you to it (because I can). I’ve shared my favorite moments….what are yours? Tam Warner Minton - How completely adorable!!!!!!!! Ruth Curran - Time is a crazy thief isn’t it? Beautifully put! We are excited this year because we actually live in a place where we might just get kids coming to our door! When my son was growing up we lived at the end of a 1/4 mile driveway and then lived in a series of places equally unsuitable for trick or treating! This year we have hope!!! Thanks for sharing your words, memories, and images! Rael Hall - We are in control of our life experiences! Time has no restrictions on us! Let’s Throw a Party! Doreen McGettigan - Awww I love your poem, I have so many Halloween memories and really miss my kids being little. I’m going to surpise my grandkids and dress up this year. Tammy - Me too, Laura Lee. It’s as good a reason as any to keep on making mischief! Tammy - Glad you enjoyed, Tam. A rare dabble into the world of rhyming! Tammy - Thanks, Doreen, it was so fun to write, but I know I couldn’t make a living out of it! You must take pictures and share them with us! Lisa T Granata - Thanks, it is lovely. Jeffrey Davidson - Beautifully written. As with most things, when we start acting old, stop learning, stop fantasizing, stop imagining and stop having fun, we grow old. There is something to be said for the insight and statements that some celebrities have stated. Lisa at Grandma's Briefs - Oh, how I miss those days, too. I don’t think I’d miss my girls at that age/stage so much if my grandsons lived nearby. Alas, not now (and probably never). Sweet, silly, and sometimes scary memories. Mary La Fornara Gutierrez - Loved reading this poem! Beautiful. Halloween is so fun I so enjoy seeing all the little ones dressed up with their parents standing at the sidewalk! Carolann Iadarola - I love Halloween! And it’s my son’s birthday so it’s a double treat! What an adorable poem and pics. Just loved it! Tammy - Hi Lisa, In writing this I realized what I have always known, silliness is important, time is a thief, and there is no one in charge of our glee and fantasy but us. Halloween is just one crazy night … but it gives us a glimpse of what it was like so many years ago. And what it can be again, if even for an instant. reminding all of us to have fun, and saying that no matter how old your children actually are, on some level they will always be your kids ready to scamper around. Tammy - You are too kind, Mel. Scamper she does….and my little girl she will always be! Hope it gave you a chuckle. Elin Stebbins Waldal - Halloween is the best, we love opening the door up to the little kids that are in the neighborhood, their energy keeps the spirit alive in a way that is pure magic. Fun post and I love that you also included a couple of pictures, so sweet. It is amazing how fast time zips past! Sheryl Kraft - How sweet! I think your poem is worth Simon & Schuster’s attention. Love looking at your pictures, remembering back to my own children’s dress-up days. Cheryl Nicholl - Great poem! I also still enjpy the thrill of Halloween thru my GROWN kids, butsince the hubby can’t STAND costuming I’m afraid I’m on my own this holiday- so I scare the crap out of the neighborhood kids instead! Nancy Hill (@nerthus) - Thank you for reminding me of Halloween. I still get all teary-eyed when my 25 year old daughter tells me that she will always remember having the Mom in gradeschool who made the absolutely awesome Halloween Cakes for her class. Marshmallows dyed green and turned into Frankenstein, shortbread tombstones, rock candy trees with gummy bats…. Thank you, Tammy, for prompting these memories. Tammy - Oh my gosh, Nancy, your description sounds ever so wonderful! I was a working mom and was the one who always showed up with the fancy schmancy spooky cupcakes from our local bakery. My poor kid never had those wonderful homemade treats for her class. But I made up for it at home, as we would bake from scratch and make a wonderful mess of the kitchen. Thank YOU for sharing with me those wonderful memories!